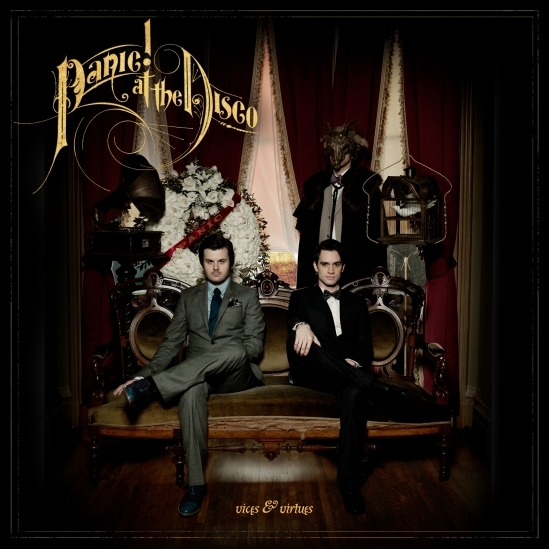 Album cover for Vices & Virtues. Copyright © 2011 by Warner Music Group. So I guess have Conan O’Brien to thank for introducing me to both this crazy awesome band called Panic! At the Disco, as they played their new hit “The Ballad of Mona Lisa” on his show back in March. Just by the first few notes, I was hooked–and after you watch the music video below, maybe you’ll be, too. “Mona Lisa” is the first track on Vices & Virtues and a pretty good opener at that. The first few seconds are just tinkling piano keys, followed by a steady bass as lead singer Brendon Urie pulls us into the ballad about the mysterious–and dare I say treacherous–Mona Lisa. Then it kicks us into hard-hitting guitar riffs and pounding drums (not unlike “Mother Earth” by Within Temptation, but less heavy metal and more alternative rock). Then comes the change in melody at 2:12, dropping us back into piano keys and Urie’s soulful voice carrying us along a passionate plea to the titular lady… and then kicking it back into the chorus reprise and finale with the same passion. So that's what a Victorian era rock band would've looked like! Copyright © 2011 by Warner Music Group. By itself, the song is great, but it was finding the music video the day after I watched its performance on Conan that sold me. The entire three-and-a-half minute sequence is a loving tribute to all things steampunk. And why not? They even managed to get the League of STEAM to be extras in it. 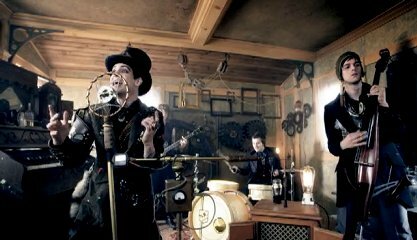 The scene depicts a steampunk-style funeral in the Old West, as Brandon Urie (in between singing) plays the ghost of the deceased man being honored. 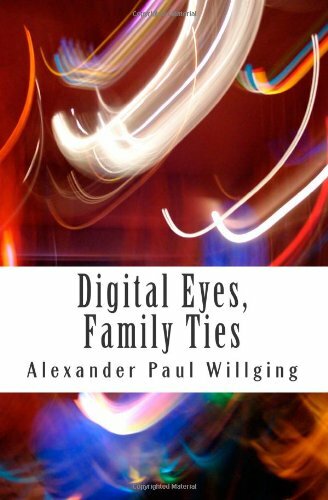 The video reveals that he’s invisible all the guests–except for one small girl–and trying to point out his onetime lover and current undertaker, Mary, is the one responsible for his untimely demise. In between all that, we get some fantastic shots of Panic! At the Disco playing retro-style rock band instruments; my particular favorite is the banjo-turned-electric guitar. Brandon Urie (when acting as the lead singer) also gets the most impressive steampunk outfit I’ve ever seen, a crazy menagerie of gears, goggles, and gold plating secured to a slick suit and top hat. Both the song and the music video are a fascinating mixture of soulful melody and pure rocking fun. Just the steampunk elements in the video alone was reason enough for me to want to review this song, although the music itself is worthwhile. Most people probably know Panic! At the Disco by their older and more popular single “I Write Sins Not Tragedies,” but this one deserves equal interest and affection. Both “The Ballad of Mona Lisa” and the album Vices & Virtues are available for download on iTunes. Bibliography: Panic At The Disco! “The Ballad of Mona Lisa.” Vices & Virtues. CD. New York: Warner Music Group, 2011.